Explore different themes and artwork every month in the Naperville Art League fine art gallery . . . 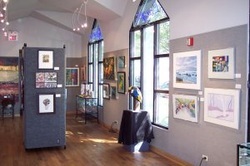 Since its inception in 1961, the Naperville Art League has provided support for local emerging and established artists. The Naperville Fine Art Center and Gallery, supported by the Art League, provides a place for artists to gather together, exhibit their original work and share their talents with the community. The Gallery is a place where both artists and the community come to learn, understand and appreciate art. The Gallery is open to the public and features classes for adults and children, workshops, demonstrations and regular exhibits.